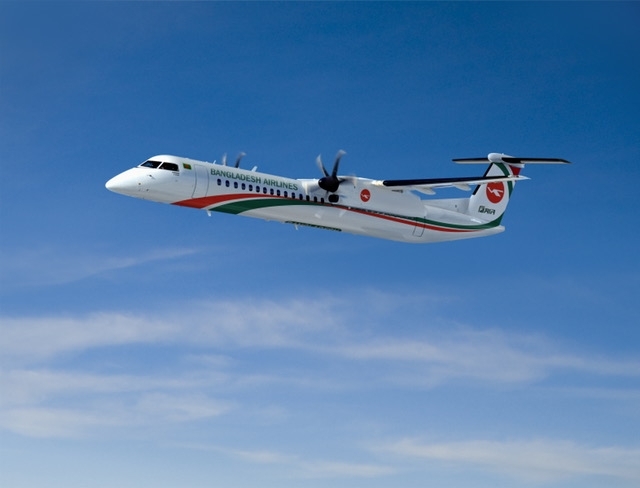 Biman Bangladesh Airlines ordered three new Q400 turboprops by signing a purchase agreement with the Canadian Commercial Corporation, the Government of Canada’s government-to-government contracting organization. Based on the list price of a Q400 aircraft, Bombardier estimates the firm order to be valued at approximately $139.5 million (US$106 million). “We currently operate two Q400s and without hesitation, we can say that these aircraft are ideal for our domestic and regional operations,” said A M Mosaddique Ahmed, managing director and CEO, Biman Bangladesh Airlines. Ahmed continues to explain the Q400 will allow Biman to offer high frequency services within Bangladesh and neighbouring countries. The national flag carrier airline of Bangladesh, Biman’s main hub is at Hazrat Shahjalal International Airport in Dhaka. It also operates flights from its secondary hubs at Shah Amanat International Airport in Chittagong and Osmani International Airport in Sylhet. Biman currently flies to 15 international and seven domestic routes.